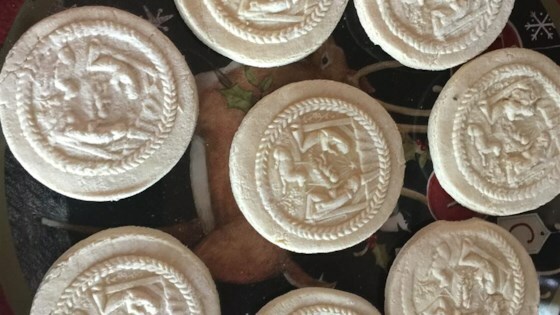 "You will need a springerle rolling pin (imprinted with different designs) for these cookies." Beat eggs until light and fluffy, gradually adding sugar ( approx. 15 minutes) This is important, do not underbeat. Fold in extract and flour. Roll dough out on lightly floured surface to about 3/8 inch. Use rolling pin to firmly "imprint" the design onto dough. Cut cookies apart and on greased baking sheet, sprinkle with anise seeds. Let cookies sit out overnight, covered, to "dry". Place cookies into oven and reduce temp to 300 degrees F (150 degrees C). Bake until light yellow only, approx. 15 minutes. They are not supposed to get brown! These cookies are a hard cookie, need to be stored for at least 2-3 weeks. You can add a slice of apple to "soften" back up or a slice of bread works, too. Replace bread or apple every 2-3 days. A family favorite for over 50 years. The grown up sons still expect these very year!